Songs of Eretz Poetry Review is pleased to present “Mammoth” by James Frederick William Rowe, Frequent Contributor and this week’s Poet of the Week. "Mammoth" is the third poem in Rowe's "Caveman Trilogy." The second poem appeared in the Review yesterday, and the first the day before yesterday. A biography of the poet may be found in our “About Our Editor & Frequent Contributors” section. Poet’s Notes: This poem concludes the "Caveman Trilogy," focusing on the collective hunt of those archetypical ice age animals: the mammoth. 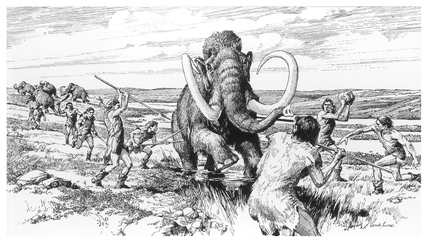 From what I've learned about mammoth hunting, the general procedure used to fell these beasts was to surround them and to attack them with spears, aiming for the soft, vulnerable groin to land the killing blow. The stealthy approach punctuated with the surprise attack no doubt startled the mammoth that, owing to its massive size and strength, no doubt killed many hunters. Nevertheless, the sheer quantity of meat from a single kill would make these pachyderms highly tempting to slaughter. All these themes are found in my poem. As we know cavemen collected the tusks, I picture them as venerated in the same fashion as the bones of the cave bear in Bear Cult. Though they may be flecked with gore, or perhaps because of this fact, they are objects of numinous power, and as the hunter depends in some sense on the continual existence of the hunted, there is an element of worship in the gratitude the hunters express to the dead mammoth. The poem was, as with the other two, begun on my subway ride, but as with Cave Painter, involved more alteration that necessitated me returning afterwards to tweak it. It did not flow quite as easily as the others, with the first stanza originally being longer and out of line with the length of the others. I changed that for aesthetic purposes, and also because I thought I composed a better second verse that took some of the excess from the first and placed it in line with my imposed form.